aAMSA, 1997. Influent concentration, percent removal, and TKN TN, NH3 TKN, and PO4 TP ratios for secondary, advanced secondary, and advanced wastewater treatment. 'Gunnerson et al., 1982. CNRC, 1993. Percent removal for advanced primary with "low dose chemical addition." dMWCOG, 1989. Percent removal and TKN TN, NH3 TKN, and PO4 TP ratios for advanced secondary and advanced wastewater treatment. «Metcalf and Eddy, 1991. TKN TN, NH3 TKN, and PO4 TP ratios of influent concentration for "medium" strength wastewater, raw total organic carbon influent concentration based on BOD5, CBODu BOD5, oxygen carbon, and ratios of C DW. ftICPRB, 1991. TKN TN, NH3 TKN, and PO4 TP ratios of effluent concentration for primary, advanced primary, and secondary treatment. 'Assume 50 percent saturation at 25° C and 50 mg/L chlorides at sea level. jTetra Tech, 1999. Mean effluent oxygen concentrations based on PCS database for primary, secondary, and advanced treatment. Mean influent concentrations for BOD5 (207 mg/L) and TSS (209 mg/L) from CWNS database consistent with influent data from AMSA (1997). ^Effluent total organic carbon concentration computed from effluent BOD5, CBODu BOD5, oxygen carbon ratio and assumption that 80 percent of organic carbon is accounted for by BOD5 measurement. Removal efficiencies computed for primary and secondary treatment are consistent with data from Gunner-son et al. (1982). Industrial Similar to the two municipal maps, Figure 2-21 presents the magnitude of the industrial effluent loading of BOD5 aggregated for a total of 1,504 catalog units with nonzero industrial loads. Figure 2-22 displays the proportion of the total nonpoint and point sources load accounted for by industrial waste loads. • Relatively low industrial BOD5 loading rates (> 0.5 mt/day) characterize many of the catalog units in the western and central portions of the 48 states. Figure 2-18 Distribution of municipal BOD5 loading by percentile of catalog units subject to municipal loading (N = 1,632) as (a) metric tons/day and (b) fraction of total municipal loading rate. 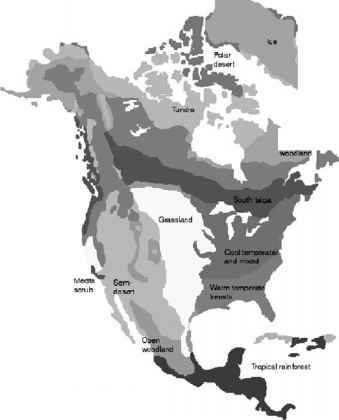 Source: Bondelid et al., 2000.
sissippi River valley, the Northeast, Midwest, and Southeast. The highest loading rates (>25 mt/day) are indicated for major urban industrial watersheds including Austin-Oyster in Texas, East-Central in Louisiana, Buffalo-San Jacinto and Galveston Bay, and the Locust River, Upper Black Warrior, and Middle Coosa basins in Alabama. • Industrial loads are the dominant component (>75 percent) of the total point and nonpoint source load in many catalog units associated with major urban-industrial areas, particularly in the Southeast. 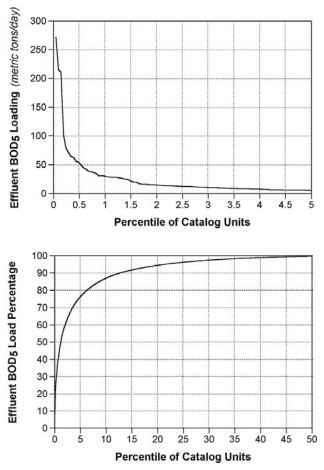 Although not shown, the frequency distributions of industrial BOD5 loads (as a percentile of catalog units with nonzero industrial loads) are very similar to those presented for municipal BOD5 loads.